Dale Strickler started the new millennium with a big idea. On January 1, 2000, he took ownership of 136 acres in Cloud county and began the long process of transforming a furrow irrigated corn and soybean farm into a subsurface drip irrigated intensive pasture farm. I wanted to improve my soil. I wanted to improve the wild life. I wanted to reduce the amount of fossil fuel. I wanted a more of a regenerative type of enterprise. Corn, soybean, alfalfa, hay – those are all very energy intensive and, I believe, soil depleting. It seems like you’re just trucking all of your organic matter and your nutrients to a different location. I wanted something where I use cattle to recycle and put that organic matter back on the ground. This is one of the annual pastures that will get rotated in a two year rotation. This is rye and it will get pastured. During the growing season, this will be the first thing that gets pastured. When the rye is pastured out, this will be planted to cow peas and sun hemp and that will get pastured off in July and August and it will get planted to hairy vetch and crimson clover. So, I follow one legume with another legume. The crimson clover and vetch with be rotated to sedan grass. The sedan grass again gets grazed in July and August and then it’s planted to rye. As far as the grazing sequence, they’ll go on Rye first, then hairy vetch and crimson clover, then this cool season perennial mix, then the gamagrass and then the sedan and the cow peas will get grazed. I try to alternate days on that just to balance the diet. Then, in the fall I reverse the situation. When I wean the calves the cows will go eat the gamagrass in the winter time, after it’s dormant, and the calves will get put on this rye. 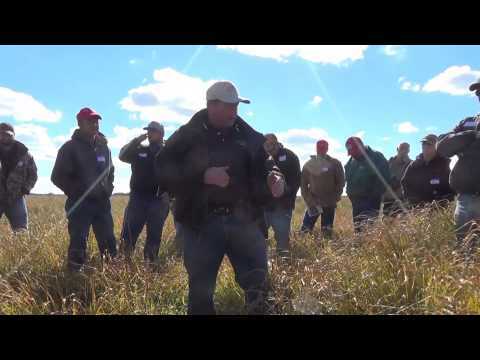 Integrating perennial grasses and cover crops into an intensive pasturing system improves water infiltration, water quality, and soil health. 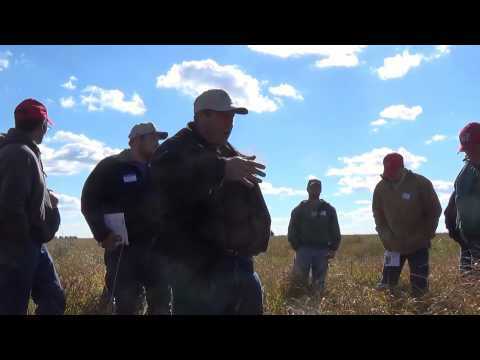 While perennials and cover crops help to improve the soil and reduce the needs for chemical inputs and therefore reduce fuel expenses, Dale explains that the biggest energy reduction is not feeding hay by sequencing grazing. Intensive pastures with a mix of perennials and annuals combined with intensive rotation and sequenced grazing saves water and energy and presents a unique path for the future. Furrow – or flood – irrigation is the oldest form of irrigation but it is far from the most efficient. In 2000, when Dale purchased his farm, approximately 29.4 million acres were irrigated with furrow irrigation. 28.3 million acres were irrigated with spray irrigation and only 4.2 million acres utilized micro- or drip irrigation. In Kansas, 2.6 million acres were irrigated with sprinklers, 647 thousand acres with surface irrigation and only 2,000 in micro-irrigation. The NRCS booklet, Subsurface Drip Irrigation: Conservation Today for Water Tomorrow explains, "In accordance with NRCS technical standards and specifications, subsurface drip irrigation systems are designed to meet a 96 percent efficiency rating.” Switching over to SSDI saves significant amounts of water, reduces evaporation and run off losses since the water is applied underground. When furrow irrigating, I started with a 17 acre inch allotment and used it all up. Since I put in SSDI and went to pasture crops, our allotment is cut back to 5 acre inches most of the time. I always have water unused at the end of the year. I was kind of limited to that system by the furrow irrigation, because you either go to dry land system or you till to build the ridges up every year and I really wanted to get away from that. You would see a pile of soil at the bottom of every row. Every couple of years the county would come take all of the soil out of the ditch, carry it to the top of the field and dump it back, and we’d start all over. I grid sampled the field here and took 40 samples across the place. The top ends of the fields were completely devoid of any fertility. The bottom ends were very high, because for 50 years the soil had been moving downhill with furrow irrigation. I put in sub surface drip irrigation so I could raise any crop I wanted to and get the water right to the roots. Subsurface drip irrigation is also incredibly water efficient. With drip tape you don’t have the evaporation losses and runoff losses. They’re non existent. It’s more efficient than rainfall because you don’t have the evaporation from the surface. I used only about half the total water on the drip tape than I do on the pivot. Dale began planting perennial grasses which is very water efficient and extremely deep rooted. Eastern Gamagrass is a hardy, warm-season grass that grows well in marginal soils—those that are acidic, compact, and sometimes flooded. It provides high yields of forage as nutritious as alfalfa at a time when cool-season grasses go dormant. The grass can also be used as a conservation planting and has potential as a bioenergy crop. This research also suggests that as temperatures increase, Eastern Gamma Grass stores more carbon. 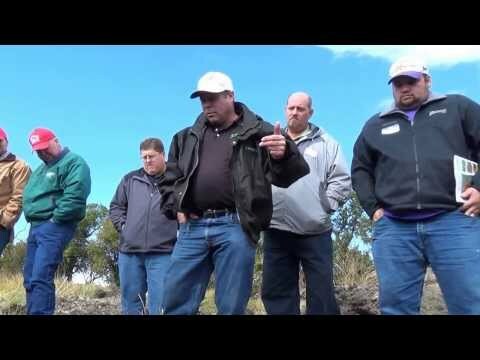 Read more about Carbon Sequestration on Dale Strickler’s property. The roots of the grass can reach down past 7 feet and easily break through clay layers that are impenetrable to most crop roots. There’s much more to this plant, though. Eastern Gamagrass roots have special tissue called Aerenchyma [pronounced air-ENK-a-ma], which has air passages that enable roots of plants to thrive in less than ideal soils. Where most plants stop root growth when oxygen depletes, the Aerenchyma tissues allow gamagrass to snorkel air down into the soil to live in wet soil break past clay layers, and thrive in droughts when other plants wilt. The roots improve the soil, efficiently use water, and provide a great forage. Agricultural Research Service (ARS) researchers explain, "These roots live less than 2 years, but when they die, they decompose slowly and help hold channels open for new generations of roots, providing the gamagrass with continued access to water in and below the claypan." Converting pastures to Subsurface Drip Irrigation, establishing perennial grasses and annual cover crop mixtures, and adopting sequenced grazing practices save water, increase resilience in extreme weather, but they also save a lot of energy. Dale’s focus on efficient water use and practices that improve soil health have positive impacts on energy use. SSDI reduces energy costs for pumping while his other innovative practices save fuel. Investing in perennial grasses completely eliminates the need for planting once the crop is established, integrating annual cover crops improves soil health, water infiltration, and increased fertility while also ensuring adequate forage is available year round, and sequenced grazing sidesteps the energy-intensive practice of haymaking. As far as energy costs, compared to raising grain crops, I don’t fire up a half-a-million dollar combine that takes $4 diesel to run. I’m not trucking all that grain off and having to replace all the fertility in it with another diesel burning operation to replace fertilizer. The manure is the fertilizer. I utilize legumes in the operation as nitrogen source so fertilizer needs are minimal. Nothing I do creates fertility; it recycles fertility. Once you create a fertile soil, you can just coast for years and years as it cycles back. Improving the fertility of the soil reduces the need for energy-intensive chemical inputs. Dale also saves energy based on the plants he grows for forage and the methods used for planting. Perennial plants like gamagrass are supplemented with annual cover crops to ensure adequate year-round forage. Using no-till methods, Dale only uses a tractor for the spring and fall plantings of annual forage cover crops. No tillage is ever done on his farm which presents big energy savings. Using a modest $3.50/gallon for diesel and $0.50 for nitrogen, these estimates would be significantly higher now. Keeping cows on pasture or raising them as grassfed beef has benefits for the animal and the product but also impacts the fertility of the land and energy costs. All this corn is produced here and we take a half million dollar combine using four dollar diesel to get it out of the field. Then we put it in the truck burning four dollar diesel and truck it down to Garden city. We round up calves and truck them off. They produce mounds of manure there and then we have to buy fertilizer to replace what we trucked off to make that $500 a head value. There’s something wrong with that picture. What if we just take the corn we grow and strip graze it out to the same calves and leave the manure sitting right where it’s going to be an asset and enrich our soil instead of putting so much manure in a concentrated area. I don’t think the real problem is that we feed the cattle corn, it’s just the way we feed the corn. My grazing capacity has increased faster than my ownership of cattle. Like most innovators, Dale is constantly looking for new ways to improve his practices. He has changed things to protect beneficial insects, like dung beetles, who are amazing creatures. Dung beetles improve nutrient cycling, soil structure, and forage growth. Even more impressive, dung beetles improve soil carbon sequestration and decrease greenhouse gas emissions. Dale has taken efforts to establish a healthy population of dung beetles on his property for all of these reasons, plus the fact that they’re really neat to watch! In the heat of summer dung beetles take over. I’ve stopped using Ivermectin because it’s pretty toxic to dung beetles. That’s why you hardly ever see dung beetles. During the summer time you see little tunnels, little mounds of soil around each of these cow patties. They make them disappear pretty quick. Getting all of this stuff buried and incorporated in the soil, either through worms or dung beetles, just kind of accelerates everything. Taking a fresh look at all of the options, Dale is also looking into tree crops as a forage for the cattle, too. If we could use fruit and nut trees to feed our livestock, rather than grain, we’d have perennial crops. Thornless Honey Locust trees produce these high sugar pods. I planted 120 of them and the rabbits and deer ate about 80. I’ve got 20 of them left. Within my lifetime it may actually do some good. In the meantime I think I’ll fatten the cows on corn, but the idea is that those things, because they drop their pods, they provide forage. My vision is to have wind breaks with a row of pine, row of that, row of pine, row of that, so you have shelter in the winter and you produce cattle feed in the winter time. Of course it is produced during the summer, but it falls in the winter and is available. So you have a feed lot in a field. While Dale’s practices are conserving water, reducing fuel costs and making good profits now, there are also long-term benefits. As mentioned in the WATER section, research shows that gamagrass stores carbon and the hotter it gets, the more carbon it stores. Carbon sequestration is a way to reduce greenhouse gas emissions by storing the carbon in the soil. Whenever the soil is disturbed through tillage, carbon is released. Simply not tilling is one way to store carbon but focusing on the growing soil organic matter increases that potential. Keeping the fertility on the land has additional benefits, too. The practices on the Strickler farm improve the soil and grow organic matter. Higher soil organic matter improves water infiltration and soil aggregation, reduces compaction and erosion, and generally leads to higher productivity thanks to more available water and nutrients. This offers a new way of thinking about growth. Well, if I have to expand my farm horizontally and bring up more acreage, then it means I take on gas. If I can expand vertically, instead of buying more soil horizontally, a deeper root zone buys me more moisture and it buys me more nutrients without having to fertilize or take on additional debt or irrigate. The average organic matter on the farm was 1.9 in 2000. In the ten years since implementing these innovative practices, the organic matter has grown over a full point, bringing it to 2.9. For every one percent increase in soil organic matter, there are about 20,000 to 25,000 more gallons of soil water available per acre – or about one acre-inch. Each percent increase also increases the available nitrogen by about 20 pounds per acre. For each percent increase, available phosphorous increases by about 2 pounds of elemental P.
Yes, you can improve your soil organic matter and not only is your soil better but you’re also addressing potentially adverse climate change. It’s effect/cause versus cause/effect. The way to increase organic matter is to stop tilling. It is a dual benefit. It reduces the amount of water I have to put on. The more organic matter I have, the more biomass I produce. The more biomass I produce, the more cattle and, thus, manure I produce. The more mature I produce, the higher the organic matter I get. It’s like compound interest. It keep increasing and increasing and increasing. I think that’s why my productivity keeps going up. It’s basically following organic matter and cycling positively instead of negatively. Chavis Lickvar-Armstrong explains how Water + Energy Progress winner Dale Strickler makes use of carbon sequestration.